Last week as I was preparing to write this piece, I text my friend James Clark who happened to be in Birmingham, AL, training Eric Bledsoe to get ready for the upcoming season. I inquired about getting a few moments with him for this weekly column. Bledsoe agreed and less than an hour later, I changed my mind and put all my NBA thoughts on the back burner. I caught the fourth quarter of a WNBA game as the Mystics were hosting the Sparks in a super close game. 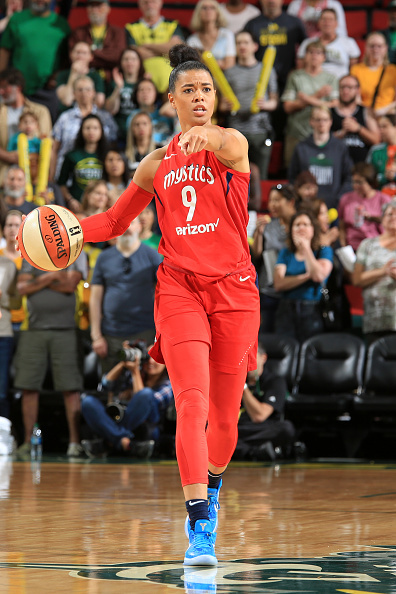 This one was knotted up at 67 in the final seconds, when Tasha Cloud sank a 15-footer at the buzzer to win it in regulation 69-67. In a word, it was an exhilarating play, however what stood out most to me was the fanfare and celebration which ensued. My social media timelines were filled with video of the shot, and Jemele Hill of ESPN The Undefeated captured the game winner on her Snapchat…she even received a post game celebratory hug from Cloud. I soon began to realize that there was more to Tasha Cloud than I had known…not only did she make an amazing shot…she has local ties to Philadelphia and people from all over the city were really excited for her and her career. I sent two text messages, one to Kristen Miles of the Washington Wizards, and another to James Clark to see which one of them could get me some time with Cloud. They both agreed to help and a few days later I had an opportunity to speak with her for about a half hour. Do you remember the first WNBA game you attended? First WNBA game that I went to was definitely a [New York] Liberty game. 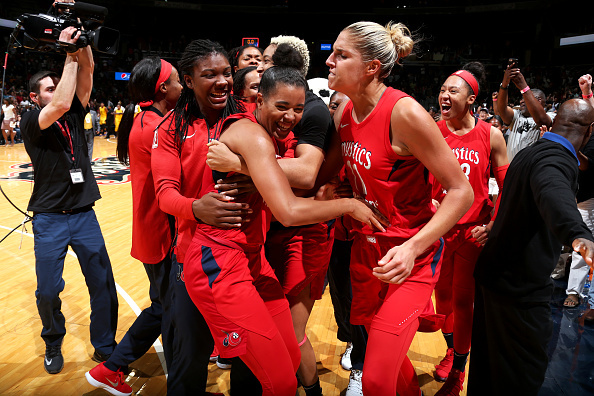 Actually no, the first WNBA game I went to was a [Washington] Mystics game. I was a little bit older, I was in college at Maryland actually, and Marissa Coleman was playing on the Mystics. They were alright then, they weren’t great but, it was still cool to see Marissa and how she was playing and excelling, especially in her early years. Can you give some insight on your basketball journey? I started late probably around 12 years old, my cousins were really good when we were younger. I played a bunch of sports when I was younger. I was a super athletic kid who couldn’t sit down. I was hyper, so my parents just put me in a bunch of sports to kinda tire me out and calm me down, from there I learned that I really liked basketball, but I was still playing other sports. When I got to high school, I got recruited to a local Catholic school around my area which was Cardinal O’Hara high school, which was super dope because I never thought I would be a Catholic school kid. They were the best team in the state and they were known nationally too, so the opportunity that O’Hara opened to me was monumental for me. Now when it came to college I went to Maryland my freshman year and I absolutely loved the University of Maryland— it’s a great school, super diverse, and it was a really good place, I loved it—but there were some family illnesses, and family is the most important thing to me. I would give this game up in the blink of an eye if I needed to for my family. When I found out that some family members were sick, it was a no brainer for me to come home and spend as much time with my loved ones as I could. So a lot of people told me I was making a really dumb decision, especially with me trying to go to the WNBA and that I was throwing my dream away. 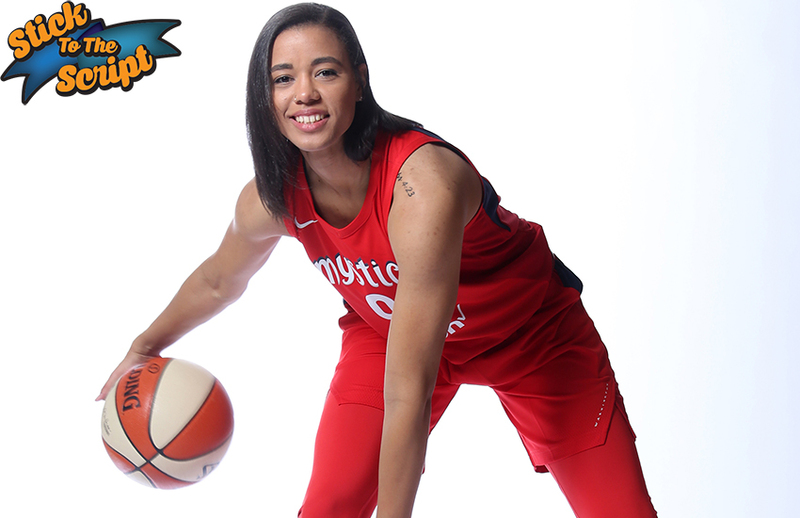 I put my head down, I worked in silence, I trusted in God’s plan for my life, my journey, and my career, and in 2015 I was a second round draft pick, the 15th overall, and now I’m the starting point guard for one of the top three teams in the WNBA. 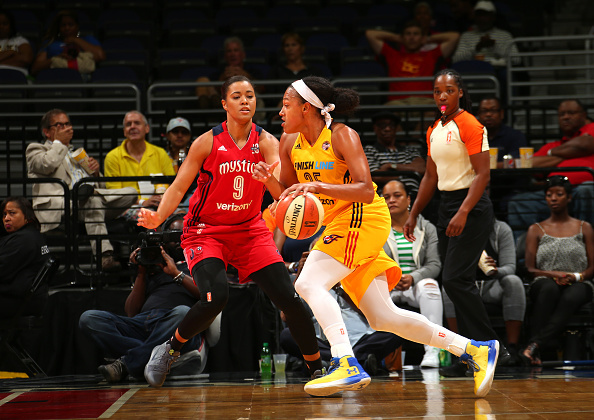 What was the 2015 WNBA draft like for you? Who did you look up growing up? I definitely was a huge [Allen] Iverson fan, but my favorite WNBA player was Lindsay Whalen, and to finish her career the other night against us was crazy. When they announced her, I was clapping like she was one of my teammates. When I was younger in my backyard, I was Lindsay Whalen, and it’s a true honor to play for these little kids. Can you explain beyond the obvious meaning of your basketball number, No. 9? Obviously, it’s a marketing tool and I can use it a bunch of different ways, but the real meaning behind it is that my dad, and I’m the youngest of 5…and he would always say, that if we ever got a change, you have to get number 9…the number initially wasn’t available, one of the vets had it, and then she got traded….I remember I was playing in Australia and I made a call and said that I need number 9, I don’t care what I have to do for it, it’s my 3rd-year, I’m somewhat of a vet. It was a really good moment that I got to share with my dad…I called him on FaceTime from Australia and he cried, because my dad’s super proud, and he’s a big part of who I am. What did the Philadelphia Eagles winning the Super Bowl mean for you personally? Oh my goodness…people make fun of me because when they won, I legitimately cried real tears. People were like, “it’s just a game,” and I was like, no, no, no…you don’t understand, when you’re from Philly, you bleed green. For me, at this point my grandfather passed and it had been two years, and when he was alive he would say that he wanted to live to see them win a Super Bowl. For me to experience that with my family was so good, and I have one of my grandfather’s old watches, so I made sure I wore that on the day of the parade so that he could experience it with me. Oh my goodness…my first ever…it was the greatest hour of my life ever! I had been having a terrible shooting night, I think I was 1 for 10 before that…really just terrible, but it was cool, because for me, I do so many other things for this team. I’ve never been focused solely on scoring, I’m a pass-first point guard that likes to defend and does the intangibles. It’s frustrating to go 1 for 10, but my teammates were confident in me, and it sucked because in the last five minutes the defense is playing off of me and I can’t be on the court too much because I’m not helping, but my team trusted me, and my coach put me back in, and I think the game was tied at 67, and I came up top…I’m running up top, thinking I’m a decoy, and then I see the ball coming toward me, and I look up at the clock and there’s three seconds left, and I knew that I had to do something with the Defensive Player of the Year [Alana Beard] on me. I just needed to create a little bit of space to get a shot off. I couldn’t go right, so I went around the back, and stepped back…as soon as I let it go I had a feeling that it was about to go in. It went in and I did my soccer run down the court and my teammates were amazing. Then I saw Jemele Hill, I was so hype, and she was filming me, that’s when I asked her can I have a hug, first and foremost. I love her! Talk about the WNBA now in terms of changing things for the future of the league. The league currently uses commercial flights. What are your thoughts on that? It’s rough. Our league is still growing, it’s a slow speed, but it’s still growing and progressing. I think there are a lot of areas we can grow in, especially starting with our salary, but traveling goes with that. We got bumped up in the standing because Vegas [Las Vegas Aces] couldn’t get here in time, so the fact that we have to fly commercial is rough. It’s tough on our bodies, especially when we’re playing back-to-back. It’s a health hazard for us, and we’re not making much money here in the States. We have to play year round, we have to go overseas in order to make a living. Imagine putting NBA teams on commercial flights and see how many games they would play a year. And we have incidents like we had when we were coming back. Kristi Toliver was sitting next to an older passenger and he had his phone out and he was texting someone and his views were ignorant and prejudiced. We have to deal with things like that. It’s crazy, like I couldn’t believe it. I saw something that said you are wearing the new Nike KD 11 for the rest of the season, is that true? Yeah. I’m still rocking with the KD’s sir! These KD 11’s that he just released are so comfortable, I feel bouncy in them, these are the most comfortable shoes I’ve worn in a while, so I’m sticking with them for a while.